Unless there are any surprises, the ballot at the financial town referendum (FTR) will again include two budgets: the one proposed by the town’s Budget Committee, and an elector petition proposing lower taxes, submitted by me. This year, the difference is between a 2.9% increase in total taxes and 0.9%. Thus far, there is no explanation of the Budget Committee’s proposal other than the full complement of meetings and the docket itself. For the elector petition’s statement of purpose and alternative docket, click here. The following is an explanation of the changes in the elector petition. Click here for a printable PDF of this document. Absentee/early voting will be at Town Hall on May 14 & 15, 7:00 a.m. to 8:00 p.m. (applications due May 1). Regular private-ballot voting will be on Saturday, May 16, 7:00 a.m. to 8:00 p.m., at Tiverton High School. The Tiverton Taxpayers Association will be working to provide information and assistance, including transportation to voting places. Email info@tivertontaxpayersassociation.org or contact the elector for more. Tiverton’s budget process provides taxpayers a wonderful opportunity to approve the town government’s budget for the next year or to offer elector petition alternatives for a private-ballot vote. Last year’s elector petition — which won by a margin of nearly two to one — held the town’s tax levy at 0.0%. 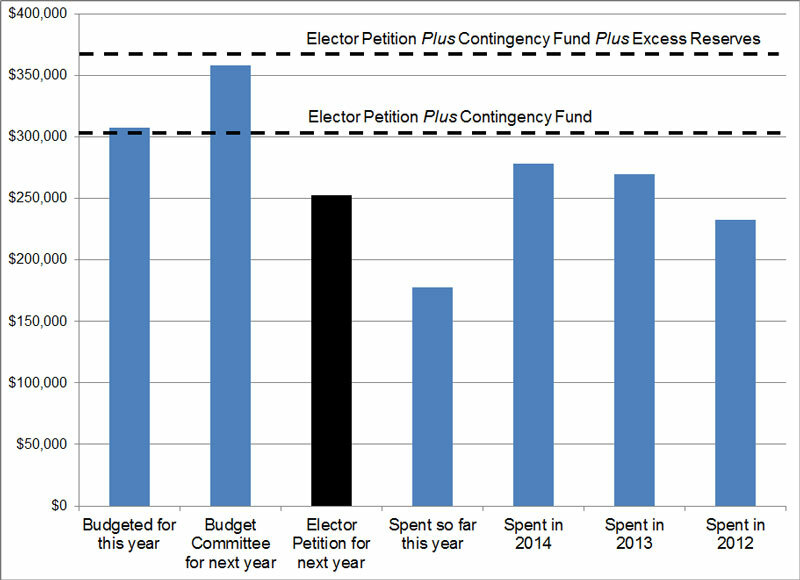 This year’s elector petition will hold the line at a 0.9% increase. The following table compares important details. In the following, dollar amounts are changes to the Budget Committee’s recommended budget. Why this number: The Budget Committee wanted to reduce the budget from last year by $20,000, but it should have gone the other way. Rationale: The roads are abysmal and need repair. With the simultaneous capital expense purchase of a hotbox to make materials go farther, this should bring a major improvement to Tiverton’s infrastructure. Why this number: Sufficient for windows and other projects, per contractors. Rationale: Tiverton has been letting its assets fall apart. This building can be maintained relatively inexpensively and taken off the repair list. Why this number: More than double the original $20,000 to a large, even sum. Rationale: Given the many reductions in this budget, it’s reasonable to leave some money in a special account to give the Town Council the flexibility to fund specific priorities, with debate and accountable votes. Why this number: Brings total to around half of initial requested increase. Rationale: This is a big year for the library, with a new building and the establishment of new programs (some with potential for new revenue to the town). The library should have a little bit of room in its first year to transition and assess priorities, to be reevaluated next year. 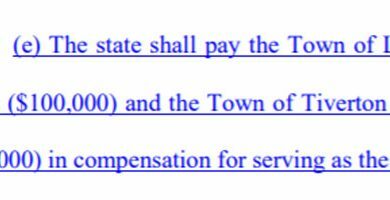 Why this number: The most that can be reduced from the requested increase, per state law. Rationale: The school department has been running huge surpluses, bringing it to a $1.5 million reserve/excess fund last June. After an unnecessary increase, last year, to pay $600,000 in overestimated special education costs, the schools don’t need to increase local money. Arguments: The school department will say that this reduction will end plans for full-day kindergarten. That’s ludicrous. Full-day K is a good idea, for which the state is providing incentive. If the schools don’t go forward with it, it won’t be because of money. It will be because they want to use our children to teach us a lesson about withholding additional funds from them. Why this number: Zeroed out the account. Rationale: Only in one of the past four years has this account had any expenditures. Sometimes money is transferred into other accounts, but then it’s just another contingency fund. strategy with labor unions. Officials should play hardball during negotiations, not leaving a pot of money on the field. The very existence of this fund runs contrary to taxpayer value. Rationale: This organization ostensibly lobbies for the town, but that too often means lobbying against taxpayers. Furthermore, its function in the budget is simply redundant. Given the Internet and related government transparency, many of the services it provides are no longer needed. Most significantly, Tiverton residents elect representatives and senators to advocate for us at the State House. We shouldn’t have to pay somebody else to do it, too. Why this number: Experienced advisor suggested this number was inflated. Why this number: Half of requested account. Rationale: Tiverton has a long history of failing to avoid lawsuits. With a new solicitor, the town should have less need for such massive legal spending every year. Why this number: Reasonable compensation for job and still a large increase over previous years. Why this number: Eliminates position when contract is up. Rationale: This is a position that was not filled for years and that does not need to be filled. Tiverton has enough employees and enough people trying to plan its future. Why this number: Eliminated a new expense. Why this number: Rounded one-third of typical spending to account, based on new practice of no longer performing duties on overtime. Rationale: The Fire Department has been running up unreasonable overtime tabs, and we cannot accept any more employees (particularly if they will exit positions that must then be filled). This needs at least another year of debate, in concert with negotiations of a new contract. 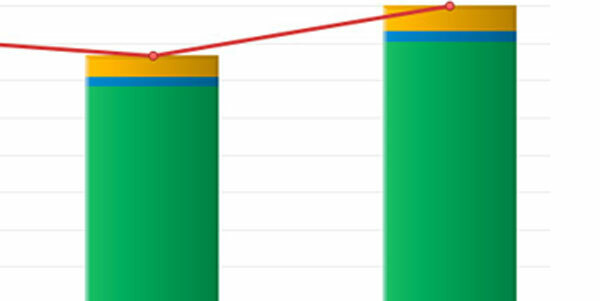 Why this number: Review of spending to date and audits for prior three years. Rationale: In 39 different accounts (at least), the town often does not spend what it budgets, which helps explain the big annual surpluses. Money should not sit in line items across the budget just waiting to be transferred. Argument: No doubt, every department head will claim that each of these line items is crucial. However, as the following chart shows, the Council has at its disposal plenty of contingency funds to fully fund every one of these 39 items and then some. Why this number: Brings the tax levy within a reasonable increase, while lowering the tax rate below $19.00 and leaving a substantial amount of money above the necessary 3% to cover contingencies and emergencies. 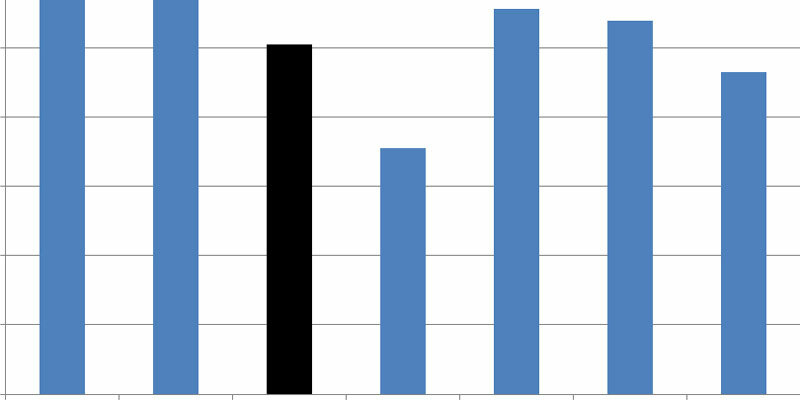 Rationale: On both the municipal and school sides, Tiverton government has been running massive (six figure) surpluses. The taxes are simply higher than they need to be. 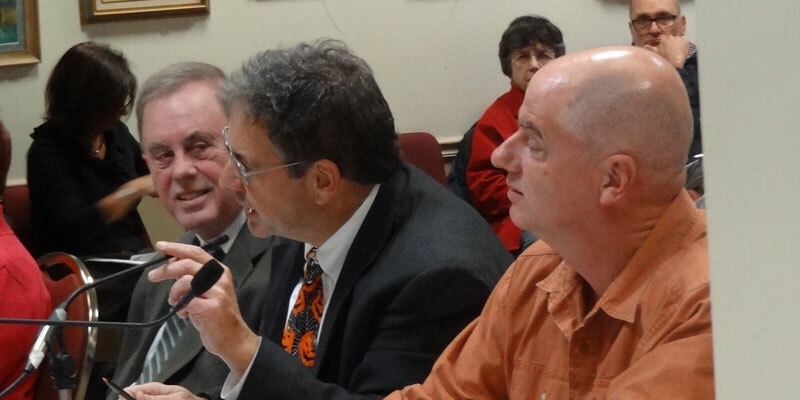 Arguments: The people of Tiverton need this money in their own bank accounts more than the town government does. Statements that this will harm the town’s credit rating are unpersuasive to the extent that they are not simply false. (Consider, for one thing, that nobody complains about the $1.5 million sitting on the schools’ books without any benefit to the rating at all).